Children’s Hospital Los Angeles (CHLA) is excited to present a new training program for the experienced registered nurse who is interested in transitioning to an acute care pediatric setting. The Versant Transition RN Fellowship at CHLA will prepare and support the experienced nurse as they enter into a pediatric specialty area. This program will be offered twice a year, August and February. 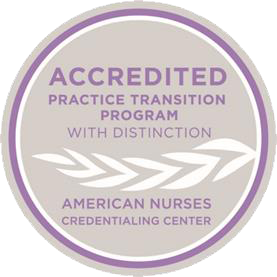 Versant Transition RN Fellowship in Pediatrics is accredited with distinction as a Practice Transition Program by the American Nurses Credentialing Center’s Commission on Accreditation. The Transition RN Fellowship, ranging from 12 weeks to 16 weeks depending on the area of specialty, includes competency-driven clinical immersion and curriculum, as well as formal mentoring and debriefing. Each transition RN receives an individualized learning plan for competency acquisition based on a performance gap analysis process. Vital professional development topics, such as career planning, conflict resolution, the culture of a new unit, self-confidence and goal setting, are presented and discussed. Online applications for the August 12, 2019 Transition RN Fellowship cohort will open on April 8, 2019. Apply online using our Nursing Career Opportunities Search. You will be able to view and apply to the areas that will be accepting applicants for this program. Please complete the entire online application, attaching a resume is highly recommended.